Within iGEM Wageningen, we attach great value to involving the public in our project. This is why we participated in several educational projects and presented our project at multiple conferences, meetings, and on various websites and in magazines. This way, we informed all the different target audiences, from children and citizens to students and scientists, about our project and synthetic biology. 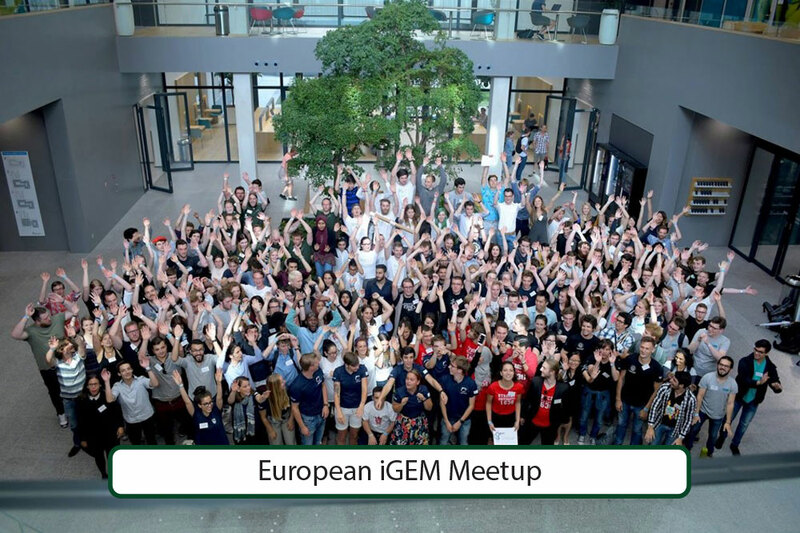 Moreover, we organized a Benelux iGEM meetup to connect all iGEM teams in The Netherlands, Belgium and Luxembourg in a meaningful way. Information about this meetup can be found here. The relatively new field of synthetic biology raises many ethical concerns. Especially when people are, for example, not educated properly about the opportunities and risks it can raise. During other public engagement projects (see below) we engaged and informed the general public about our project, synthetic biology and the iGEM competition. However, in the activities listed in the next section we took it a step further: from informing to educating and engaging in one-on-one conversation. 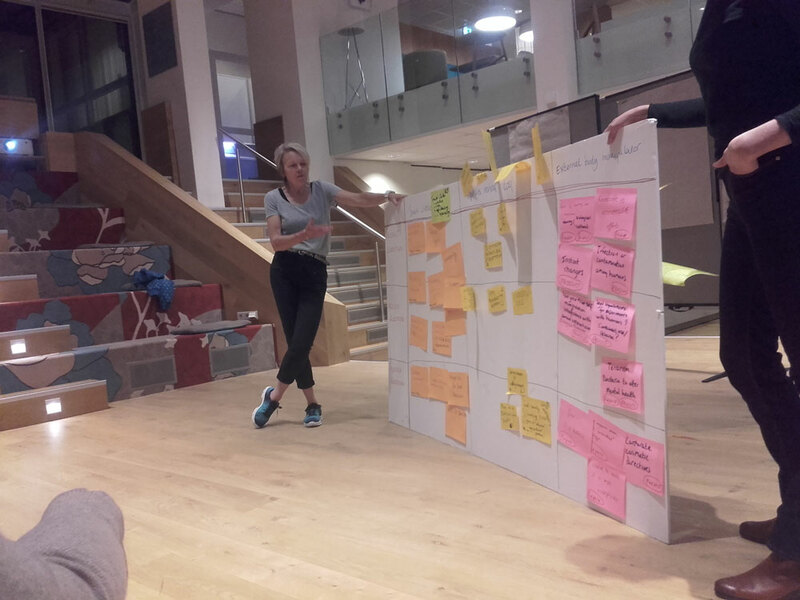 We collaborated with Wageningen University & Research students following the course “Quantified Self: Monitoring Dietary Behaviour”. In this course the students had to apply the idea of a quantified self (QS) to an existing project. We followed lectures on the topic of QS, to gain more insight into the topic after which we showed the students our project and progress so far. We informed them about our goals and the developed device. They applied this knowledge to the QS principle. The students made a poster about the topic, which can be found below. Will people be able to diagnose themselves in the future? According to the QS movement, a key contemporary trend emerging in big data science , they can. The QS movement involves integrating technology in people’s lives, aiming to gather information about themselves and learn from this. Read more about how we implemented this in our design! They presented our case and their suggestions to their fellow students via a poster presentation. Figure A: Poster that was made for the Quantified Self course by the students. It describes our project, and applies the Quantified Self principles to it. Swan, Melanie. "The quantified self: Fundamental disruption in big data science and biological discovery." Big Data 1.2 (2013): 85-99. The National Biology Olympiad (NBO) is the selection round in The Netherlands for the International Biology Olympiad. This is a biology competition for talented secondary school students. The international finals were held this year in the United Kingdom, with 4 students per country competing in this science olympiad. The students are tested on their abilities to tackle biological problems as well as performing laboratory experiments. Its aim is to promote science to young students and to emphasize the importance of biology in society. In the national finals on the 9th of June in Wageningen, twenty students of The Netherlands gathered for a week of science. We contributed to the NBO by educating the students about DNA techniques and the field of synthetic biology. A summary video of the whole NBO can be found here. Before the lecture, the students knew about Golden Rice and insulin production by microorganisms as the only examples of biotechnology. During the practicals on plant genetics, we gave a one-and-a-half hour lecture about current techniques for the manipulation of DNA and other topics regarding molecular biology and its applied use, followed by an exam of 10 closed and 2 open questions. This covered the basics of gene expression and DNA construct assembly, as well as more complicated assembly methods and modification techniques. Attendees were introduced to the field of synthetic biology, a subject that was new for most of them. After the lecture, they were encouraged to think about the rational and ethical issues that may arise with this technology. This way, we involved these students in synthetic biology and our iGEM project, and we got their input into these fields as well. The students concluded that they saw the potential in synthetic biology to combat infectious diseases. However, it also raises some safety, ethical and biocontainment-related concerns. Following these findings, we worked on the proposed issues. The outcome of this can be read on the biosafety page. Figure 1: We educated the participants of the National Biology Olympiad about DNA techniques and synthetic biology. The opportunity to improve food production. For example, increasing yield by resistance introduction, drought-resistant crops, and more sustainable production. Production and development of medicines. Both developments of novel, better and cheaper medicines were mentioned, as well as better diagnostics. General, non-specific improvements in current and new industrial processes; faster, easier, more efficient, and economically favorable. Reduced impact on climate, by using synthetic biology for protection of the environment, protect threatened animal species, and improvement of sustainability. By mutations or combinations of different genes, hazardous microorganisms can be created or formed, like bioweapons, superorganisms, antibiotic resistant bacteria etc. Fear of possible dangers of the end-product made via a GMO-production process. Lot of uncertainties and misunderstandings about safety of GMO-products. Ethical issues on modification of organisms and transferring genetic material of one species to another. Religion-related ethical issues: interfering with God’s creations. Hard to set boundaries in genetic modification; are we going to modify people in the future? The possible negative effect on an ecosystem and lowering biodiversity when GMOs are introduced in nature. Availability of treatments. After diagnosis, sufficient medicines should be available to treat the diagnosed people. If treatment is not available, resources are insufficient, or the people cannot afford treatment, a diagnosis will not improve the quality of life for these people. Overpopulation in those areas. Lower mortality rate by good diagnostics can result in overpopulation, and possibly more hunger and unemployment problems. A prerequisite that was proposed by several students was sufficient education about the kit itself, and the consequences for one’s life after diagnosis is confirmed. Finally, the success rate of this diagnostic kit in third-world countries was compared to western countries (The Netherlands) by asking the opinion of the students. Fifty percent believed that the use would be more accepted in The Netherlands because the Dutch population has a higher education level and would understand the purpose and the action of this kit and are thus more open to it. Here, people can afford health care and are used to novel techniques. About 30% believed that the use of this kit would be less accepted in The Netherlands because people are more aware of the dangers of GMO’s. Moreover, the health care in The Netherlands is satisfactory as it is. The other students were indecisive or thought there would not be a difference in acceptance levels. When such a diagnostic kit would be available in The Netherlands, the ideal antigens to be detected according to the students are cancer and STDs. Moreover, Mono, HIV and Hepatitis B were mentioned, as well as tropical diseases for travelers. We also presented our work at the RIVM (the Dutch National Institute for Public Health and Environment) during their “Weekend of Science”. The public, which consisted mostly of children and their parents, could attend multiple workshops and presentations organized by the institute. We had a stand where we could put our project on display. By making a comic on biosafety, we educated children on the safety aspects that come with the use of GMOs. Moreover, we presented our project using our poster and distributed the postcards of the iGEM postcard collaboration. The children liked the colorful comic and postcards, and while they performed some childproof science experiments, the parents wandered around our stand. The families could take both postcards and comics home, to read them further and think more about the issues we presented. Figure 2: Some of the children visiting the Kennisparade of the RIVM and reading our comic. To this day, social media is a great platform to reach the wider public and our target audience. Apart from keeping our followers up-to-date on our project progress, we also used the platform for public education, posting several memo’s conveying the messages of biosafety, ethical analysis and more. Take for example the biosafety post below. This post is a simple and approachable way to learn about the basic safety measures we take inside the lab. We even got a reply from the iGEM Foundation! Figure B: Facebook post about the biosafety measures we take in our laboratory. The NBV, the Dutch Biotechnology Association is the organization for all professionals in the field of applied life sciences in The Netherlands. 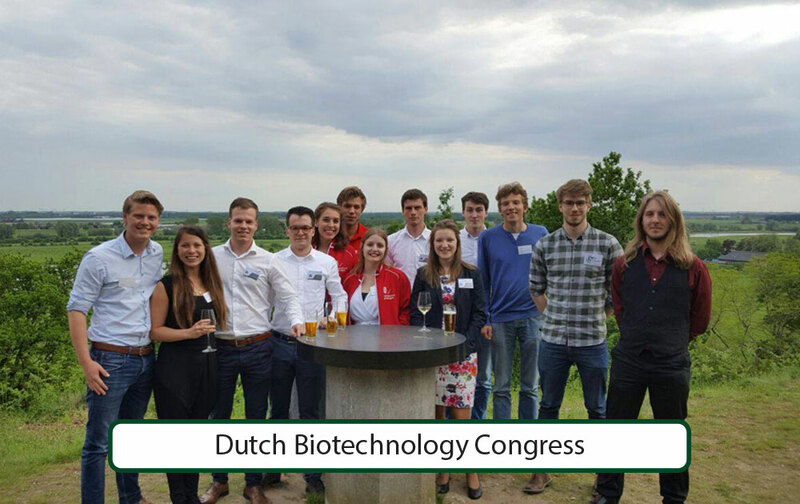 On the 17th of April, they organized the yearly Dutch Biotechnology Congress (NBC-17) in Wageningen. iGEM Wageningen 2017 was present with a poster presentation to clarify our project’s aims and goals. The highlights of the conference can be found on the website of NBV. 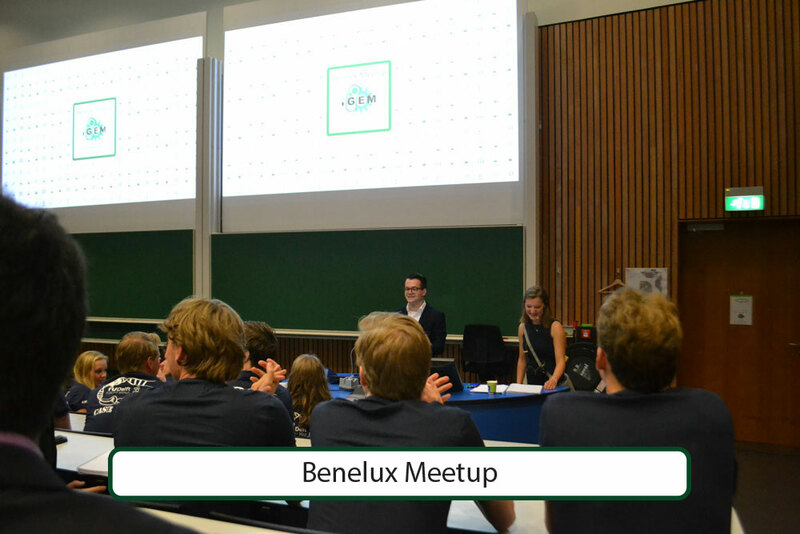 On the 24th of June, we organized the Benelux meetup: an iGEM meetup for all Belgian and Dutch iGEM teams. Part of this meetup included presenting the project. More about this day can be found on the meetup page. 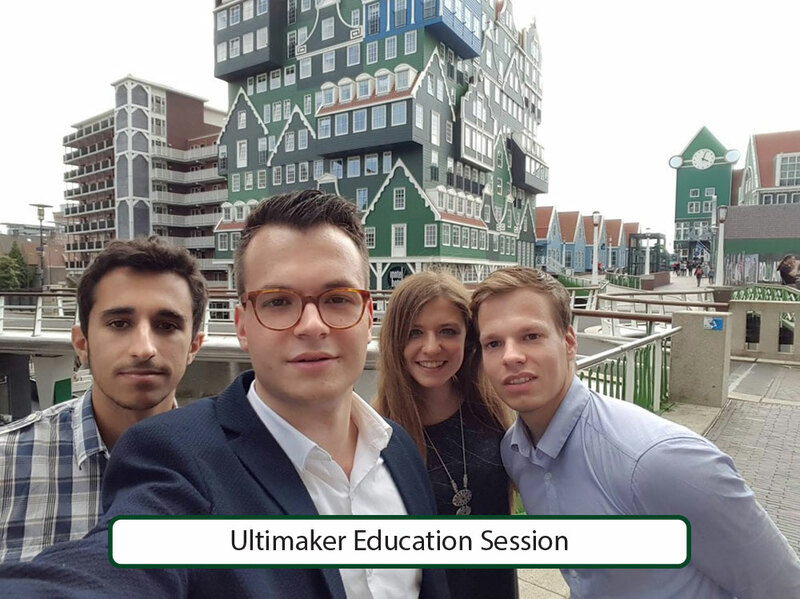 On the 4th of July, we participated in the Ultimaker Education Session in Zaandam. Here, the newest innovations in 3D-printing techniques were showcased. We presented our device, both in a presentation and at a poster stand, and got some valuable tips on refining the settings of our 3D-printer from Ultimaker. iGEM TUDelft organized an European iGEM Meetup. On the 7th of July, various teams from all over Europe gathered in Delft for a symposium. This included three speakers that talked about implementation of synthetic biology and poster presentations of the iGEM teams. The Central Veterinary Institute (CVI) is the bioveterinary research institute of Wageningen University & Research. Located in Lelystad, it is commissioned by the Dutch authorities and carries out research related to vaccine development, diagnostics and animal health in general. On the 10th of July, we gave an elaborate presentation on our project, during which we discussed the setup and story with the people at CVI. 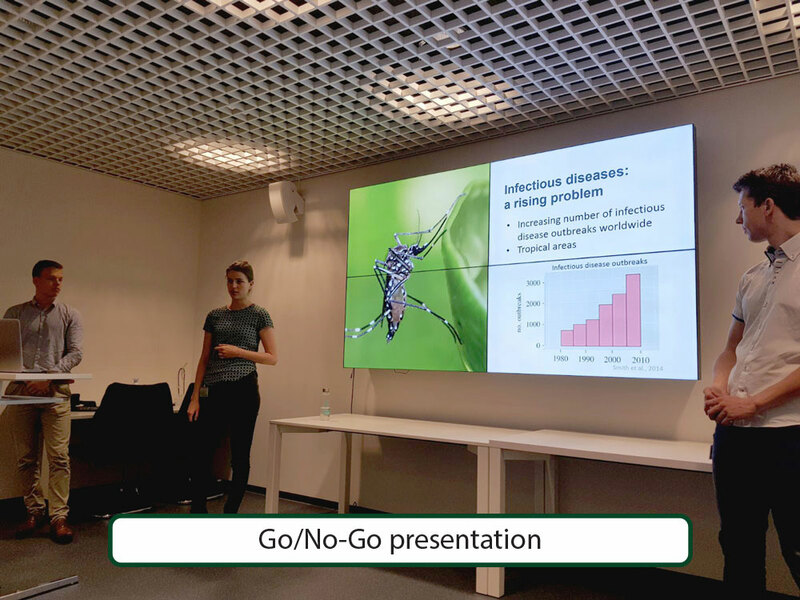 In order to involve our colleagues at the university in our project, we gave a Go/No-Go presentation, where all researchers and students in the relevant chair groups were invited to attend. Here, we gave a comprehensive 20-minute presentation on our project, how far we had come, and how much we were still planning to do in the last few months before the Jamboree. Afterwards, the audience was able to ask questions and vote if we made enough progress to proceed and participate at the Giant Jamboree. We got some valuable input and tips on the science part of our project, as well as the way we tell our story. Luckily, more than 90 percent of the public voted for a 'go'! 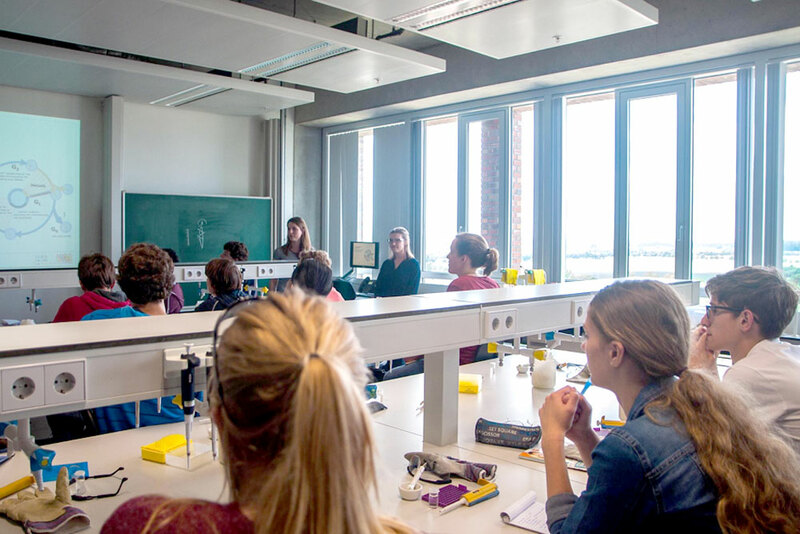 During the introduction week of the new academic year of Wageningen University & Research, we presented our project to the new batch of master students in Biotechnology. This way, we already taught them something about synthetic biology, and hopefully got them hooked on participating in iGEM next year! After the presentation, we got some great comments and several curious and interested students who wanted to know more. 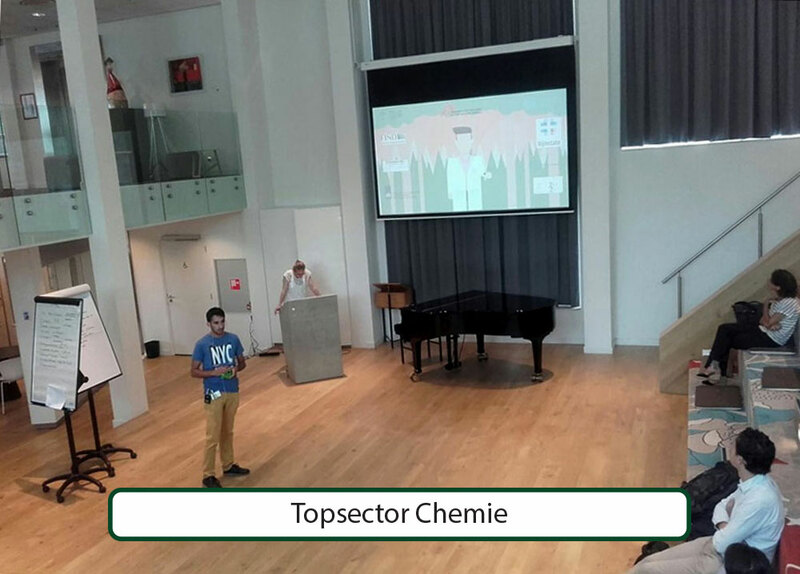 One of our team members pitched our project at the annual Topsector Chemie closing ceremony in Wageningen, at the 30th of August. This short pitch focussed on the challenges we face in using synthetic biology. Topsector Chemie is an organization with the goal to find solutions to big social challenges. These are the so-called Grand Societal Challenges by the Horizon 2020 program of the European Commission. Topsector Chemie approaches these challenges from a chemical point of view, collaborating with other top sectors wherever possible. 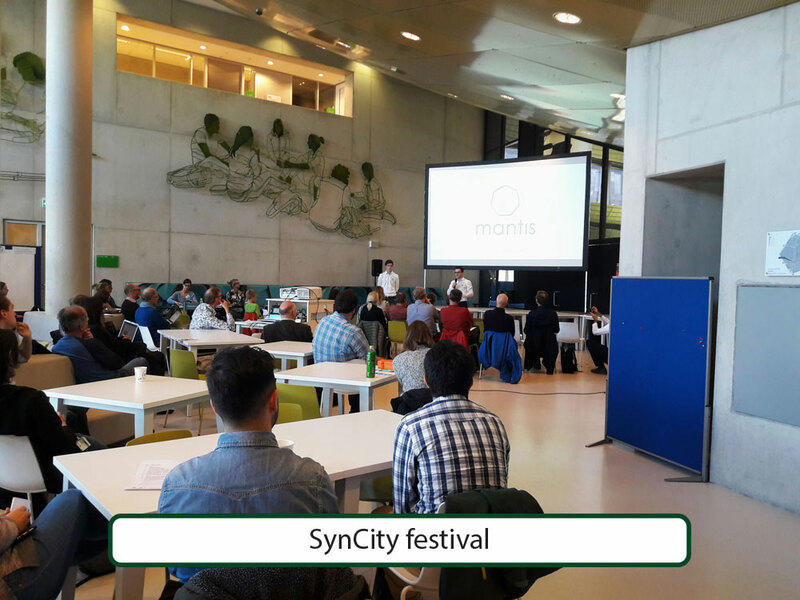 The SynCity event was organized by the Laboratory of Systems & Synthetic Biology at Wageningen University & Research. The event was a film and art festival held on the 5th and 6th of October about synthetic biology to involve the general public in this field. Here, both citizens, scientists and students could discover the field of synthetic biology and how it can be used for many purposes. This is done from an artistic point of view. Via art, synthetic biology is depicted, for example with a series of short movies. Together with iGEM Wageningen 2014, we presented our view and projects. Moreover, as follow-up of the SynCity days two dialogue evenings were organised in which synthetic biology issues were discussed. These evenings were set up as workshops and were open to the general public. This was a nice opportunity for us to discover the different interpretations of synthetic biology and the chances or pitfalls it offers for society according to the general public. This also included a discussion on the role of implication analysis and risk evaluation in science. Staff members mentioned that in their daily work, not much attention was paid to thinking about the societal implications of their studies, although it becomes a more and more important part of acquiring funding or approval of research proposals. A consensus was reached that discussions such as these are important for both scientists and the general public to exchange their visions and expectations of synthetic biology and its implications. This way, the field of synthetic biology will become both highly innovative while being publicly accepted. This shows again that public engagement is an important part of projects such as iGEM, and science in general. Figure 3: Discussion about the implications of synthetic biology. For one day, we took over the Snapchat account of Wageningen University & Research: WURSnap. Here, we Snapchatted throughout our day. 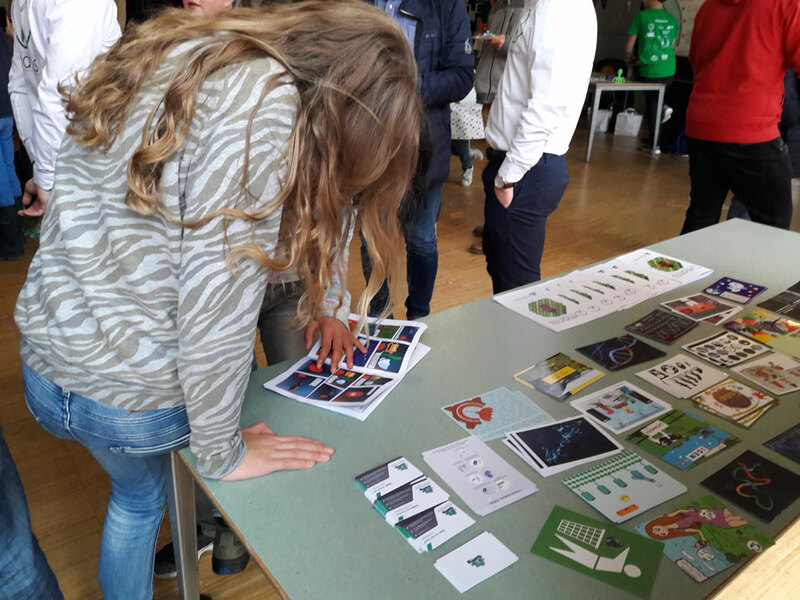 We showed the target audience, mostly secondary school students who are interested in studying at Wageningen University & Research, what we do throughout the day, and that science is really versatile and interesting! 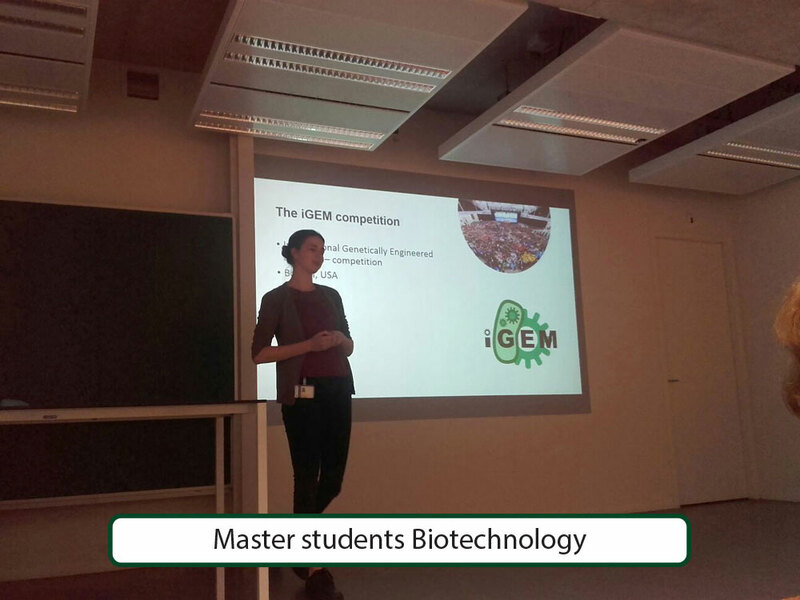 This way, we not only promoted the Wageningen University & Research but also brought the iGEM competition under attention by these future scientists. NEMO Kennislink, an online magazine that focuses on making scientific news reachable to the general public, posted an article on iGEM and our project. This magazine targets Dutch citizens with an interest in science. You can read the article made by dr. Nico Claassens "Spanning in het lab voor de synthetische biologie wedstrijd van het jaar" (in Dutch) on the website of Kennislink. Resource is the magazine for students and employees of Wageningen University & Research. After being interviewed by ing. Stijn van Gils, he posted an article on the website. Link to the full article: "Students work on field test for tropical diseases". Later, a second online article about our Go/No-go presentation was published: "Wageningen iGEM team off to Boston". This was also published as an article in their paper magazine, both in the Dutch and international version. With some tips from the Science Information Officer of Wageningen University & Research, dr. Jac Niessen, we wrote a press release about our project. The article “Wageningse studenten ontwikkelen diagnostische test voor Zika” was posted as a news article on the website of the university (in Dutch). Following our Go/No-go presentation at the end of August, ing. Liesbeth Idema, the online editor of the Wageningen University & Research Intranet, published a short article “Support Wageningse iGEM-team bij detecteren tropische ziektes”. The intranet of the Wageningen University & Research is only accessible by employees. The article covers our aim and raises attention for our Crowdfunding project. Bionieuws is a magazine for biologists in The Netherlands. Via drs. 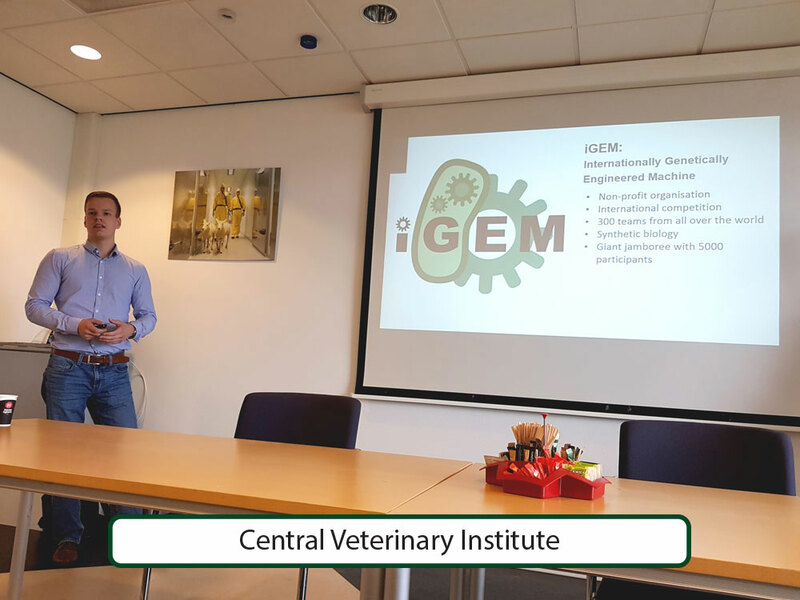 Gert van Maanen, a small article in their magazine on the iGEM competition was posted (25 August 2017, year 27, page 12), featuring all Dutch iGEM teams, including iGEM Wageningen. The article, “Zes Nederlandse teams in iGEM-competitie” (in Dutch) cannot be reached online, but the page of the magazine can be found below. 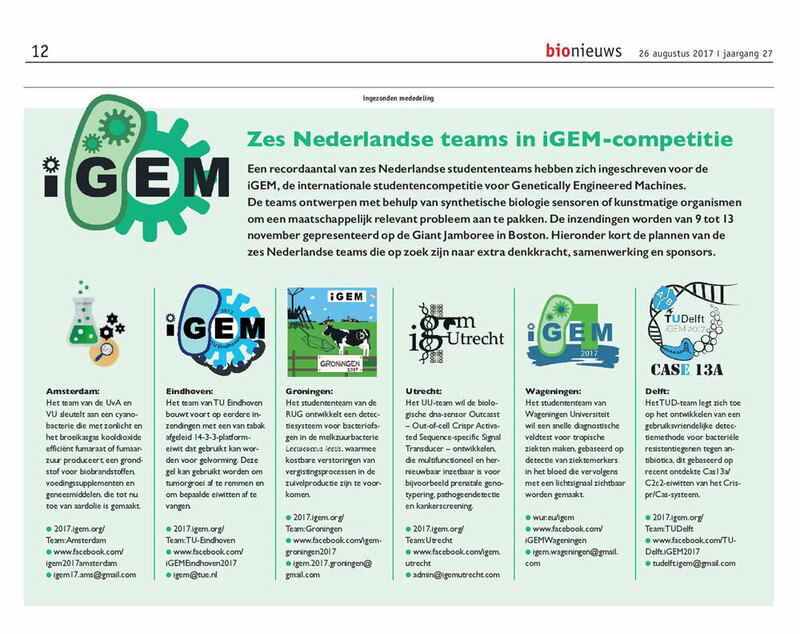 Figure C: Article about the Dutch iGEM teams in Bioniews magazine of Aug 25, 2017. The Global One Health blog is an initiative of Wageningen University & Research. Global One Health is a theme that reflects the interconnectedness and global nature of health care. More specifically, it focuses on interdisciplinary ways for controlling the risk of disease outbreaks and reduction of endemic infectious diseases. Not only for human health care, but also for food supply, hygiene, medicines, vaccines, vector control and crop protection. More about this initiative can be found here. For this initiative, we wrote a blog about the rise of infectious diseases, taking African Sleeping Sickness as an example for the problematic situations in tropical regions with regards to infectious diseases, and how there is a need for a new diagnostic device. Moreover, an infographic was made to visualize our device. The blog can be read on the website of Global One Health blog (in Dutch). 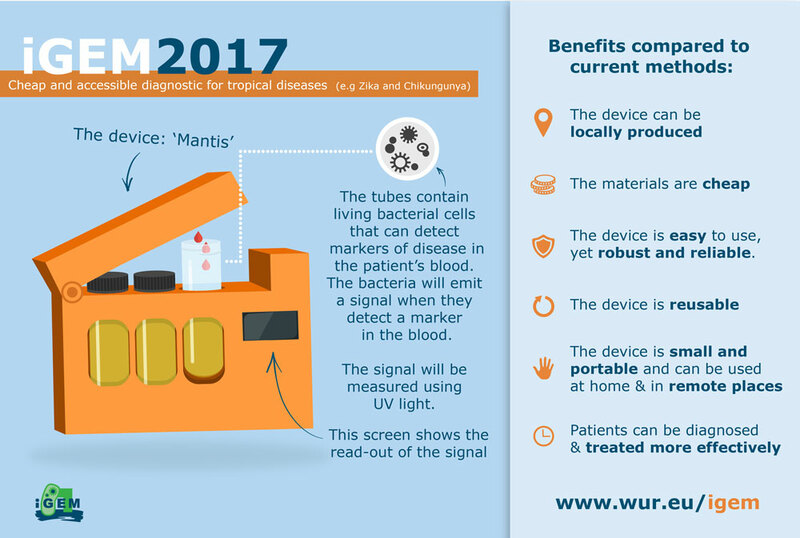 Figure D: English version of the schematic overview of the Mantis prototype, created for the Global One Healh blog. The International Students Blog of Wageningen University & Research is part of the Wageningen University & Research blog platform. It shares experiences from international students studying in Wageningen. Here, one of our international team members wrote a blog about iGEM and her experiences as an international student. 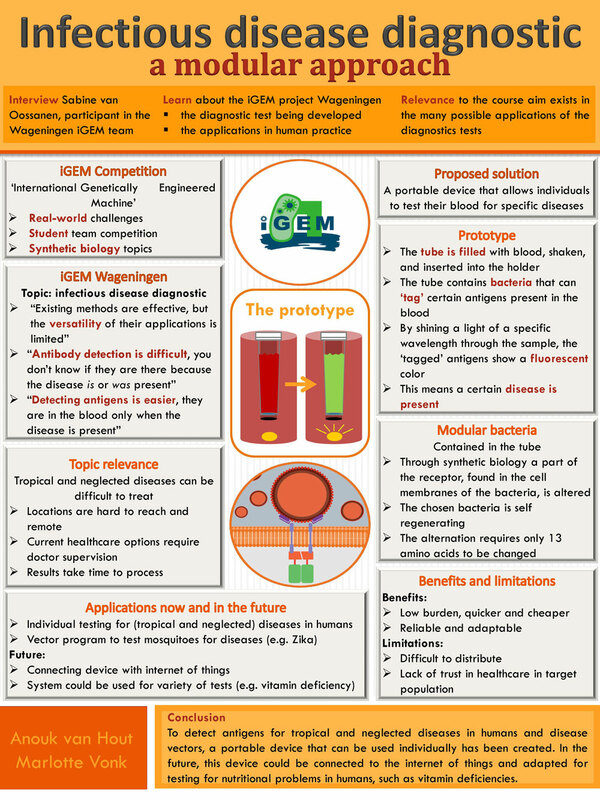 The blog, "Joining the iGEM competition" can be read online.